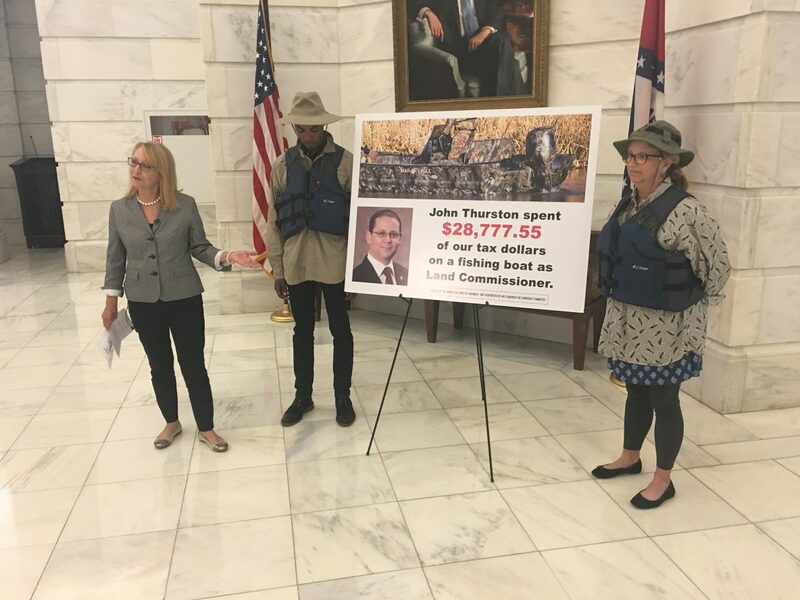 LITTLE ROCK－Susan Inman, Democratic nominee for Secretary of State, at a press conference at the State Capitol criticized Land Commissioner John Thurston’s purchase of a nearly $30,000 bass boat with taxpayer funds. Inman said Thurston wanted a new toy and had Arkansans pay for it. Thurston is Inman Republican opponent for Secretary of State in November. According to findings uncovered by the Blue Hog Report via Freedom of Information requests, in 2014 the Office of Land Commissioner spent $28,777 on a new 18.5-foot War Eagle bass boat, a Yamaha outboard engine, and other boat-related items. Receipts from the Land Commissioner’s office also show his office went on a shopping spree purchasing boots, sunglasses, gloves, and even a scent-controlled infrared hood. “The Game and Fish Commission has roughly 600 boats that John Thurston could have borrowed for free, but he wanted us to buy him new toy instead,” said Inman. “What’s worse is the Land Commissioner’s Office says they’ve only officially used this boat just six times in four years, so Arkansans are paying thousands of dollars to store Thurston’s toy. “If this is how Thurston treats your tax dollars, just imagine how he’d manage your personal records, your business records, and your voting information as Secretary of State,” said Inman. “Can you trust this kind of person? The Secretary of State’s office is serious business. That’s why from day one I have announced detailed plans and made promises to protect Arkansans voting rights. I’ll protect voter integrity and implement a Vote-By-Mail system. >>> Donate to Susan Inman for Secretary of State today.